torquay, victoria, maroubra and collaroy, nsw. Toquay Beach, Victoria. 25th November 2nd December 1956. " Between the Flags Exhibition, ANMM, Sydney. 22 April 2007. These include Joe Quigg, Matt Kivlin, Dave Rochen, and Dale Velzy in California. The only book that can be said to adequately examine this period is Paul Holmes' 2006 publication, Dale Velzy is Hawk, Chapters 4 to 8. 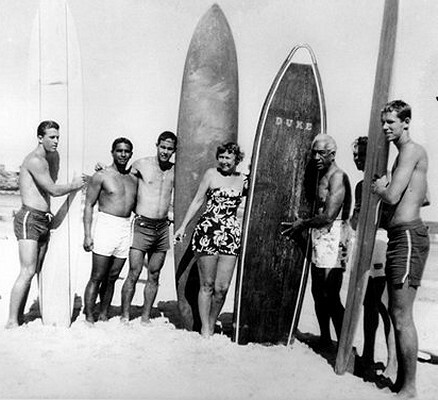 In 1950-1951, the first recorded fibreglass and balsa wood surfboard in Australia accompanied Hollywood actor and Malibu Point surfer, Peter Lawford. He was in Australia in 1950 to film Kangaroo. The board was identified by Albie Thoms (2000) as a finless board by Dave Rochlen Surfboards, stored at Bondi for most of Lawford's stay and ridden by locals Jack 'Bluey' Mayes, Ray Young and Aub Laidlaw. While filming, he left the board at the Bondi surf club, where it was ridden by the local beach inspectors, Jack 'Bluey' Mayes, Ray Young and Aub Laidlaw, though it didn't seem to impress them, with Laidlaw later achieving notoriety for banning both bikini-wearers and boardriders from Bondi Beach." pose on the beach at Waikiki, in 1947.
made of balsa and fiber glass. Duke tried it but preferred his own 16 footer. Severson's date of 1947 is incorrect. wearing the same Hawaiian shirts. Saturday 25 November 1950, page 17. The board was possibly the work of Bob Simmons, Joe Quigg, or Dave Rochlen. See Matt Kilvin on Joe Quigg and Dave Rochlen in Longboard, Volume No. pages ? From Levy, Shawn: Rat Pack Confidential, Fourth Estate Limited, London, 1998. Peter Lawford was born in England in September 1923, his conception resulting from the then Mrs. Mary Aylen's adulterous liaison with her husband's commanding officer, Sydney Lawford. The scandal surrounding Peter's birth drove the Lawfords from the country; they were to live in France, India, the South Pacific, Hawaii, Florida, and California for the rest of their days, maintaining, frequently enough, a sufficiently high standard of living to seem gay globe-trotters, but, in reality, terrified to return home to the hisses of English scandal-mongers. There was, however, another social group with which Peter mingled and to whom he showed an. especially generous and loyal side of his nature. Having been introduced to surfing as a young boy in Hawaii, Peter had a genuine love for beach life, and he spent all the time he could at the shore, catching waves, playing volleyball, and steeping himself in the lingo and rituals of beach bums- a cultish society whose vocabulary and attitudes would later be borrowed, in a fashion, by the Rat Pack. May hated the ne'er-do-well manner of this crowd -which, of course, attracted her son to it even more. Moreover, Peter relished mixing his surfing and acting cronies, watching the cultures clash with sophomoric delight. Peter Lawford died on the 14 December 1984 and following four years of family disputes, his ashes were scattered in the Pacific ocean. 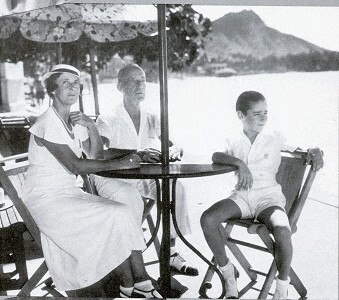 Peter Lawford aged 11 at Waikiki, 1934.
terrace with his parents, Gen. and Mrs. Sydney Lawford, in November 1934. Lawford would go on to a long acting career and a marriage into the Kennedy clan. Hawaiian Archives. 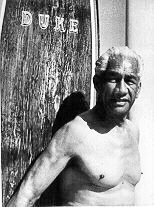 Pictorial Histories Publishing Company, Montana,1986, page 89.
with the great surf champ, Duke Kahanamoku. London (1998), between pages 184 and 185. 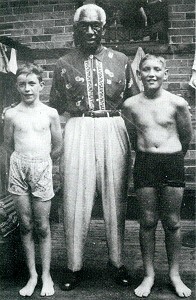 The photograph was probably taken at the same time as the photograph of Lawford with Duke and Richard Boone, above. Note that Lawford's board is significantly shorter than Duke's massive board. Doubleday and Company, New York, 1967, pages 29 to 33, with a selection of Duke photographs on pages 33 to 37. Surfer (probably John Severson): Duke, these foam boards that are ridden today are quite a bit different from the big, heavy solid wood boards of your day. Duke: This board of mine, which I have today, is sixteen feet long, twenty-two inches wide, and three and a half inches thick. You speak about these light boards. The first (light) board I tackled was Peter Lawford's board. When Peter first came to Honolulu, he brought this board, and we swapped boards right out there at Canoe's surf. It was kinda tricky, as you know. I thought, "Well, I'd better stick to my own solid board, which is steadier and easier to manage." I said to Peter, "You better give me my board and you take your board back." And that's the swap and that's the last I ever rode on one of these tricky boards they have. But these kids are really expert on handling these boards. They spin around and then come right up and hit you in the head. And then they put the brakes on and that board comes up and then goes backwards, and (laughing) I don't know where else it goes. - Severson: Great Surfing (1967), page 32. 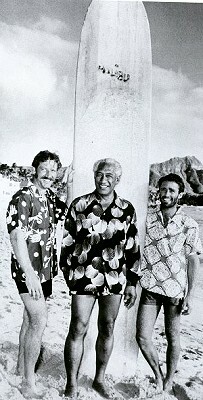 Richard Boone, Duke and Peter Lawford pose on the beach at Waikiki, in 1947. 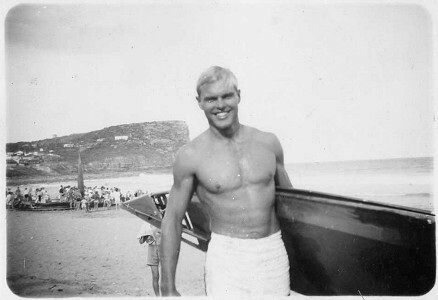 - Brawley, Sean: The Bondi Lifesaver- A History of an Australian Icon. 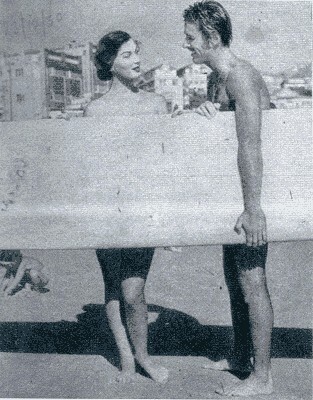 The visit to Bondi of American surfer and film star Peter Lawford with his Dave Rochlen "10 and a half foot, banana nosed, solid balsawood" and fibreglass board in 1950 is detailed on page 216. Brawley reports the board was ridden by Aud Laidlaw, Basil McDonald and Pam Pass. Significantly, Pam Pass's recollections question Albie Thoms' (2000, page 63) claim that the board was finless, see Notes Chapter 8 #19 page 323. He notes the board was generally known as a Zip board, but by it's Bondi riders as Peter and states Lawford never called the board a Malibu. This is difficult to reconcile with the accompanying (previously unpublished) photograph of Lawford and the board at Bondi. The image is appears to be newspaper quality and is dated by hand as “13/12/1950”. This is almost certainly the same board photographed at Waikiki (above) on the way to Australia in late 1950. Not so clear, but certainly identifiable in both images, is the word MALIBU in offset script across the nose. If not Lawford, then someone (the second candidate would probably be the builder, Dave Rochen) added this decoration. Firstly, Lawford was not a particularly outstanding practitioner of the art of surfing. As a surfer he was the real deal, surfing meant a lot to him. I think he first learned on a trip around the world with his parents, in Hawaii. Some of the Malibu guys who were around at the time also say he was the real thing. Not a poser, he loved to surf. - personal email, February 2007. It would be the power of the fin that would mesmerise surfers in 1956. This, despite, Brawley reporting the recollections of Pam Pass, indicating that the board did have a fin. The board closely resembles a Simmon's Spoon, a revolutionary design closely associated with Californian shaper Bob Simmons, circa 1949. 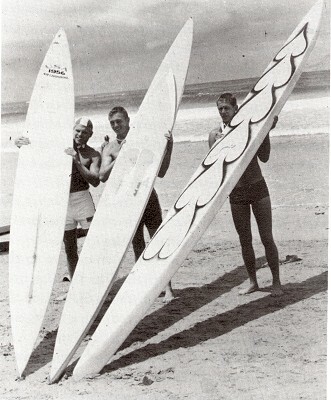 These boards were noted for their shallow long based fins, as illustrated by a photograph of Lawford in The Pit at Malibu, circa 1953, see below. There is a possibility that one of these was the board Lawford brought to Australia. (Bondi Surf Bathers Life Saving Club). Following Peter Lawford's visit to Bondi, some Australian board riders experienced the superior performance of the Malibu board on their cross Pacific travels. A merchant seaman, Ray The Admiral McKeon rode hollow boards in the late 1940s and early 1950s, on Sydney's south-side beaches. He first visited Hawaii serving on a troop ship in WW II at 15, falsifying his age on enlistment, and while serving as a merchant seaman had his first rides on finned balsa ten-footers on Oahu’s South Shore around 1953. He recalled I absolutely loved them, but I couldn’t bring one home back then as I didn’t have the dough. Moving to Sydney’s northern beaches around 1958, Ray worked as a sander in Gordon Woods’ new factory in Brookvale between berths on ships and was among the first to regularly surf the breaks along the peninsula. According to the Wollongong SLSC, boardrider and member Ted Burns rode a Malibu board when he competed in one of the early Makaha contests. After the first scheduled contest in 1953 failed to provide waves, it was conducted successfully the next year, won by George Downing, with Rabbit Kekai the champion in1955. "Ted Burns competing at Makaha in 1950 - said to be the first Australian to compete in Hawaii." History of Wollongong City SLSC 1915-2000, page 27. September Volume 50 Number 9 pages 173 - 173. Surfing has been Williams' life from the time he joined Queenscliff Surf Club at the age of 12. 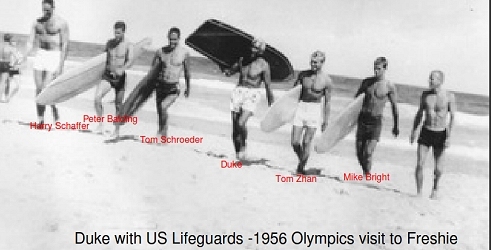 In 1953 a reprenentative team of Australian lifesavers visited the U.S.A. and Hawaii'. Noll records the initial Australian response to the new design was a mix of scepticism and laconic humour ..
"... a head honcho (unidentified) from one of the surf clubs in Australia came over to look at them. come straight in in the soup, while all the girls on the beach squealed." Noll(1989) Page 70. 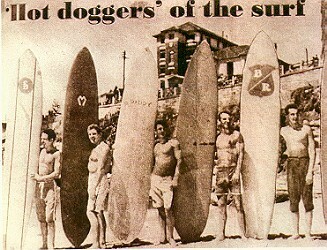 This may possibly be a casual assessment of current surf life saving and competition practice, but from the early 1940s Manly boardriders regularly rode at Fairy Bower, a powerful right hand point/reef break where to "take off on some white water and come straight in in the soup" is not a practical option. Dan De Rego, Tom Zahn, Peter Balding, Lew Hanka, Ralph Kanoho, Tom Moore, Henry Kanoho, Reginald Fellaze, Tom Schoeder, Don Gustuson, Harry Schaffer (Delegate)." 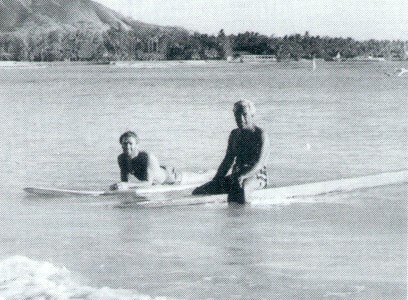 He also forwarded a photograph "of Tom Zahn who was the Hawaiian Board Champion. The photo was taken at Mona Vale Northern Beach surf carnival. The board was 16ft. with a timber frame with a rubber skin over it. He went down a wave and snapped it in half. I won the board race that day." - Thanks to Eric and Don. As the teams were accommodated adjacent to Manly, a major research resource should be The Manly Daily. Unfortunately, for reasons unknown, the paper failed to archive copies circa 1955-1958 and none are held by the Manly-Warringah Library. Instead of the Australian belt and reel, he used a "torpedo buoy' ". Wollongong - November 1956, undated, but before Wednesday 24th. "Gordon Woods bought a 9' 6" Malibu type, Bob Pike acquired a 9' 6" semi-gun from Ted (sic, Tom) Schroeder and I paid Tim Guard 46 (pounds) for a beautiful, hot curl board built by George Downing." Bob Evans : remember the time when...' Surfing World Volume 16 # 4 1972 pages 30 to 35. "When we left Australia, we also left our boards for the Aussies." Tall, bronzed life-savers in their brightly col ored uniforms, slowly ¡land majestically marched across the sands of Torquay yesterday - and 1 70,000 people cheered one of the most spectacular scenes of our Olympic Games Carnival. Thirty-five teams representing the U.S.A., Hawaii, Ceylon, South Africa, New Zealand, Great Britain, and local and interstate surf life saving clubs-competed in the international surf carnival. From 10 a.m. to 4 p.m. the events continued non-stop. As the crowds increased, they packed the beach, then the headland - soon cars took over the golf course. And then the tide turned, and coming in shore, started nibbling the golden beach away. The colorful march past was put forward an hour to 1 p.m. - and even then there was hardly enough beach left for the 35 bronzed and youthful teams to march on. Wearing colorful costumes of blue tops with white stars, a white centre band, and scarlet trunks, the U.S. team brought cheers from the huge crowd. But the more experienced New Zealanders won the international march past, with Ceylon second, and South Africa third. 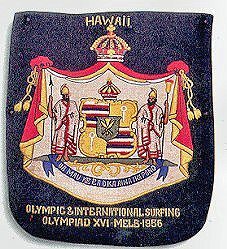 White-haired Duke Kahanamouku, sheriff of Hawaii and former dual Olympic swimming champion, sat among the carnival crowd with Australian "Boy" Charlton, another former Olym pian. "It's great," the Duke said, "the sight of surf always thrills me." But for once the Torquay surf was rather tame, no boats were up ended and the small waves were hard to catch. 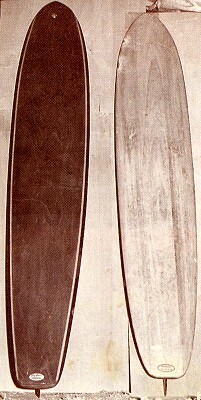 The Americans caused a surprise when they appeared with their version of surf boards. Very narrow, and made of light fibre glass, they proved a lot faster than the normal Australian board. And our reel-and-Iine method of surf rescue astounded them! The American idea is to carry a coil of nylon line into the surf and play it out as they swim to the patient. Judge Adrian Curlewis, Australia Surf Life Saving Association president, said the international Olympic carnival had brought about an exchange of ideas - the Americans were going to try our reel-and-line method, and we would experiment with their torpedo line. Judge Curlewis added that an international advisory surf committee would now be formed. Hawaii won the International beach relay from South Africa and the U.S.
Tom Zahn, of Hawaii, won the board race from Mike Bright, of U.S., and G. Williams, of Western Australia. New South Wales won the interstate rescue and resucitation from Queensland and Western Australia. Jim Fountain, of Victoria, won the senior interstate belt race from R. Hounslow, of Western Australia, and R. Reid, of South Australia. The Americans claim the Australian reel and line is cumbersome, and that the "torpedo" would halve rescue time. The nylon line is in a rubber buoy fastened under the patient's arms. This rare and interesting item was contributed by Gary O’Donnell, November 2012. "This memento was given to my Father, Michael O’Donnell, (who) was a member of Torquay SLSC, was in the group that first surfed Bells in 1948-9, and he chopped the first walkway to Bells Beach with his Axe . I thought you might like a copy of this one as originals are very rare, I have seen a painted one at Torquay surf museum but no other." (edited). 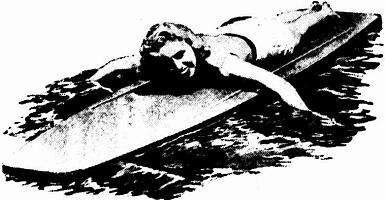 Indicative of the versatility of American Easi-Bild patterns is this smart, serviceable surf board. Thousands of surf devotees have hankered after a surfboard, but the high cost of the commercially made article has ruled out ownership for them. Now you can build your way to riding the waves on this 10-ft. surfboard with an American Easi-Bild Pattern. No. 247, that makes construction absurdly simple. Pattern price, only .. 7/6. AMERICAN EASI-BILD PATTERNS PTY. LTD.
"Colin (First) was responsible for bringing back the concepts to build the first Malibu's in Western Australia from the 1956 Surf carnival held in Torquay which coincided with the 1956 Olympics in Melbourne Australia. I have shown pictures here of the 1956 Torquay board race demonstrating the boards they were using which were later merged into the first true surf skis. The initial paddle skis were kragga skis which were canvas covered and it took three people to get them in the water. The frame of one of these Kragga skis is shown in the pictures. The Kragga Ski and the longboards merged and this became the first true surf skis with footstraps and paddles tied to the front on which paddlers still stood up on. The skis later progressed to fibreglass versions which were much lighter although a far cry far from the current 9kg skis of today. 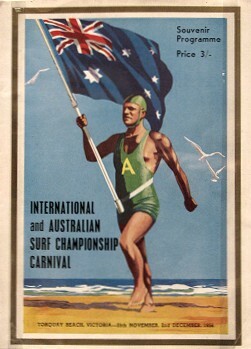 The Americans came to Australia for the 1956 surf life saving carnival and the legendary Greg Noll (The Bull) was a part of the team. I asked Dad about the race and meeting the Americans. All he can remember is being pushed under the cans by one of the Americans and having a huge party at the Torquay Hotel and waking up under his car with a hangover from hell. The picture of the old Holden with the boards was the trip across the Nullarbor (3429km) to the carnival with Kirk Jarrots uncle leaning out the window. Kirk placed 10th in the Molakai this year. Dad built the first Malibu's in WA after this trip and was one of 6 surfers on the Perth Coast at the time." - Fisher, Craig: The Pre-history of Ski Paddling - an Aussie Perspective, 28 May 2008 (viewed August 2010). Brawley notes the inclusion of the "Marathon surf" event, a multi-discipline race, as a fore-runner of the modern Ironman event. Conversely, the enthusiasm to assist in a rescue by the inexperienced could also be detrimental. "Countless beltmen have been hauled in to the beach unconscious, several have even been drowned, through inexperienced but well meaning members of the public rushing the line to assist in rescues." Forbes in Myers(1983) page 18. 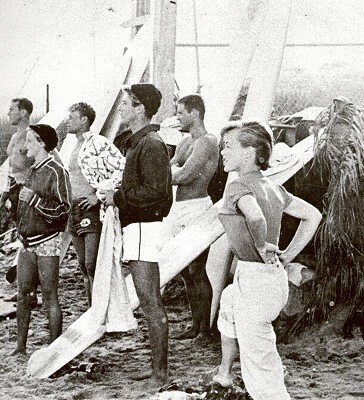 Duke returns from the water with members of the USA Surf Life Saving Team, Freshwater, 1956. -photograph courtesy of Eric Middledorp, Freswater LifeSaving Club, September, 2013. 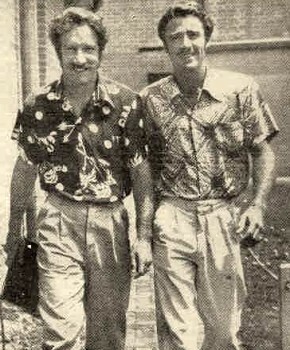 In correspondence with Eric Middldorp, Freshwater SLSC member Don Henderson recalls the members of the American and Hawaiian Teams visit to Freshwater Beach November 1956 were:Dan De Rego, Lew Hanka, Ralph Kanoho, Tom Moore, Henry Kanoho, Reginald Fellaze,, Don Gustuson, Harry Schaffer (Delegate)." Franki: Balmoral Beach Club (1989) Page 41. Their ability was recognised from their fist appearance at Cronulla. "I had bought a Bell and Howell movie camera from (snow ski film producer) Warren Miller. The final Malibu board, decorated with the initials "S D" , is of particular interest. Historians of surfing culture may note the riders are wearing long legged shorts, certainly a radical change from all previous Australian beach wear. 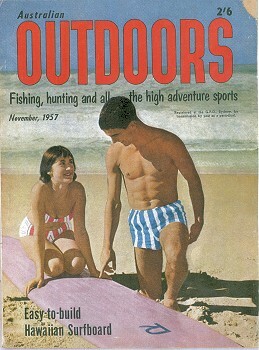 A colour version of the above newspaper/magazine photograph was later reproduced in Barnett: Australian Sport (2005), page 309, accredited to Private collection. that accelerated with the introduction of polyester foam blanks. 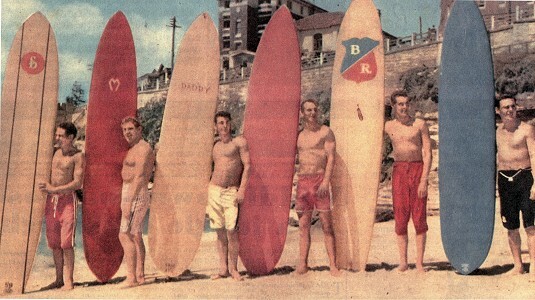 "a couple of the old guys still surviving at Dee Why SLSC went to the surf carnival associated with the 1956 Melbourne Olympics and apparently that trip was when a lot of Aus surfers first saw US malibu boards and quickly started to copy them." Police have been told the 6ft. fall, husky Sparks was a "fickle and reckless lover-out with a different girl every night."
? A woman's handbag was found in the murder 'car, but police do not necessarily connect it with the . killer. Police were told a man was seen running from Sparks' car after local residents heard shots about 7l30 a.m. But they believe the man who was seen running had left another car parked on Marine drive. Thompson st., Tamarama, about half an hour after the residents heard the shots. two 9mm. bullets in the left : arm, a third into the shoul- , der, and a fourth in the chest. Detectives found four shells from the bullets on the floor of the car. Police are not sure whether the shots were fired from the front or back seats. A bachelor, he lived with his mother in a flat in Bondi rd., Bondi. He told his mother early ; last night that he intended going to a picture show.